Dr. Brad Rodu is a Professor of Medicine at the University of Louisville. He has been an ACSH advisor for many years, and has written or co-written many of our publications on tobacco harm reduction. ACSH takes great pride in the distinction won by our remarkable roster of friends and advisors. Their knowledge and insight informs our work. Today we take delight in offering the perspectives of two men who contacted us about recent subjects of our Dispatch. Yesterday brought news that smokeless tobacco manufacturer Star Scientific had issued a press release saying that they would ask the FDA to formally acknowledge that their new moist smokeless tobacco product, called Stonewall Moist-BDL, was 90-99 percent lower in carcinogens than those offered by their competitors. The tobacco lozenge maker is asking the government for “modified risk” approval. While speaking to over 30 University of North Carolina Wilmington students, Paul Turner Jr., director of the N.C. 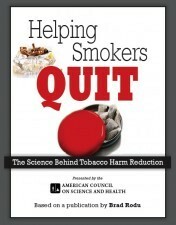 Spit Tobacco Education Program and former director of the CDC’s oral health division, haphazardly groups various smokeless nicotine products, including dip, snuff and snus, into one category — harmful to human health — despite each having its own risk profile. The reason for allowing it on the market is that smokeless tobacco is an effective substitute for smoking, but far less hazardous to health than cigarettes. [ ¦] Switching provides a substantial health benefit to smokers who switch, in fact switching is not that much different to quitting smoking altogether. Smokeless tobacco and e-cigarettes are being recognized as safer, satisfying cigarette substitutes by increasing numbers of American smokers, writes ACSH advisor and professor of medicine at the University of Louisville Brad Rodu. Yet as Rodu also notes, Tobacco prohibitionists appear to be countering with a national misinformation campaign aimed at dissuading smokers from switching to smoke-free alternatives.